Despite what the name suggests, Good Old Games does not only have old games from 15 years ago. Yesterday I bought the game FTL for $7.49. 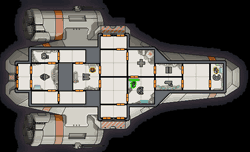 FTL was released this year and is an interesting mix of gaming concepts: you control a ship and her crew and try to bring it as far as possible in front of a wave of invaders. Ship control are extremely simple: you can select where energy is allocated, and on what part of the enemy ships you systems fire. The crew moves in a zelda fashion in the ships, manning stations (providing bonuses), fixing systems and fighting intruders. Each solar system has an event, which is described in plain text, sometimes ambushes, sometimes exploration opportunities, sometimes trading posts. The goal of the game is to collect scrap, fuel and ammunition to make it as far as possible, which is far from trivial, the game is quite challenging for me in easy mode. The graphics of FTL are interesting: a mix of old school pixel sprites for the characters, simple low depth views of the shop, and gorgeous deep colour background images. The sound-track is quite nice. All in all this game managed for me to capture the spirit of Elite or Escape Velocity, with games that last half an hour, not half a lifetime. If you liked those games, FTL is worth checking out. This entry was posted in English, Games, General, Macintosh and tagged Elite, Escape Velocity, Good old Games.